Classic Dusty Springfield Band Concert Posters and Memorabilia! Buy Online Now! Britain’s greatest pop diva, Dusty Springfield was also the finest white soul singer of her era, a performer of remarkable emotional resonance whose body of work spans the decades and their attendant musical transformations with a consistency and purity unmatched by any of her contemporaries; though a camp icon of glamorous excess in her towering beehive hairdo and panda-eye black mascara, the sultry intimacy and heartbreaking urgency of Springfield‘s voice transcended image and fashion, embracing everything from lushly orchestrated pop to gritty R&B to disco with unparalleled sophistication and depth. She was born Mary O’Brien on April 16, 1939, and raised on an eclectic diet of classical music and jazz, coming to worship Peggy Lee; after completing her schooling she joined the Lana Sisters, a pop vocal trio which issued a few singles on Fontana before dissolving. In 1960, upon teaming with her brother Dion O’ Brien and his friend Tim Feild in the folk trio the Springfields, O’Brien adopted the stage name Dusty Springfield; thanks to a series of hits including “Breakaway,” “Bambino,” and “Say I Won’t Be There,” the group was soon the U.K.’s best-selling act. 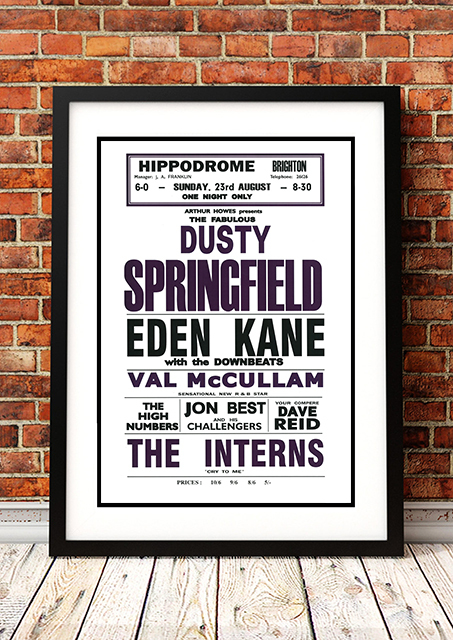 We stock some awesome Dusty Springfield Band Concert Posters.